How often do you aspire to bake something a tad bit sweet – but still healthy – only to be disappointed by the effort and ingredients you have to put in? The sweet tooth simply isn’t as easy to address when you’ve transitioned to eating no refined sugar since there’s nothing readily available at your fingertips, for most of us anyways. Even if you are ready to get to work in the kitchen, some of the dairy-free, gluten-free, sugar-free treat recipes can be intimidating. The paleo apple crisp, though? Not so much. The ingredients are minimal, and it’s a one-dish affair. This recipe traditionally features a crust, which is omitted in the ones on the list below. The crumb is typically comprised of flour, sugar, and a bunch of other stuff you aren’t eating anymore, but these recipe mavens have found a way around it. Want more warm and comforting meals? This is all the joy of pie without the hassle of making the crust. This crumble is served up single-serving size in individual ramekins, but you could always opt to use a larger baking dish instead. Strawberries and apples are the featured dynamic duo, making for an interesting flavor combination with a subtle, just-sweet-enough taste. Shredded coconut, macadamias and dates lend loads of texture to dig into. Not an apple pie enthusiast? Maybe you just haven’t had the right recipe yet. Perhaps, you’re more of a crisp or crumble type of person. In that case, this recipe is for you. With its caramelized apples and slightly crispy outside, this dessert has plenty to offer up at your next BBQ or family gathering. It’s made with wholesome, real-food ingredients that everyone can feel good about eating. Here’s a unique recipe with a refreshing and tart flavor complex. She uses green apples like Granny Smith and takes down the sour profile with a bit of honey as the sweetener. The best part of this recipe for the primal people out there who tolerate dairy is the easy as pie (or crisp!) directions to making your own whipping cream. Don’t worry, there’s a coconut milk adaptation too if you aren’t yet familiar with the creamy goodness. You could use either/or for countless desserts or just plain fruit. There is hardly a better way to enhance an apple dessert than by adding an equally crisp fruit such as pear. With nearly just as many varieties as the apple, you can fine-tune the taste with the seasons or just plain ol’ personal preference. This crisp packs in the nutrition with grass-fed gelatin as a thickener. Sweeten this dish with some local maple syrup, and dessert is on the table. This is the ideal recipe for the fall when you’re stuck in a pumpkin rut by using the best that autumn has to offer. This one is a simple fix for a night when you just want to cozy up with something warm and sweet. This vegan-friendly recipe features warm spices like nutmeg and ginger with a swig of maple syrup to kick up the comfort just a notch. This crumble couldn’t be simpler, and if you have apples on hand, you probably have the rest of the ingredients lying around somewhere! Ten minutes, you say? I think I can do that. Better than its simplicity is the tiny fraction of time that lies between you cooking this and you eating this. A quick granola hack is just roasting some of your favorite nuts and chopping them up. This recipe is easy to make with what you already have handy. This apple crisp adaptation is brilliant because it provides the recipe for that gorgeous little scoop of perfection that tops any classic apple crisp – ice cream! This was the first paleo dessert recipe that The Paleo Mom ever tried to recreate, and it took her nearly a year to make it perfect. Consider this your staple apple recipe for when the season hits. She recommends using a blend of Fuji, Crispin, and Rome apples for the best taste. Her secret to the perfect flavor is muscovado sugar which has a hint of molasses flavor. Its mineral content is also high because it is unrefined. Get the recipe here. The finished product of this dessert is much like a cereal, topped with almond milk or coconut milk (your choice!) for a meal that can easily double as breakfast porridge. If you miss oatmeal, this one’s for you! This recipe is unique because the crisp includes both almond meal and toasted sunflower seeds. It’s important to mix up your seeds and nuts for the best balance of nutrients or recognizing potential sensitivities. The secret to this captivating crisp is grass-fed butter. As a replacement, it’s recommended to use sustainably sourced palm oil which you can find here if you don’t tolerate dairy well. Moving on, the crunchy top is comprised of a blend of coconut flour and blanched almond flour. If you don’t care much for coconut flour, you can substitute a similar gluten-free option with great results. 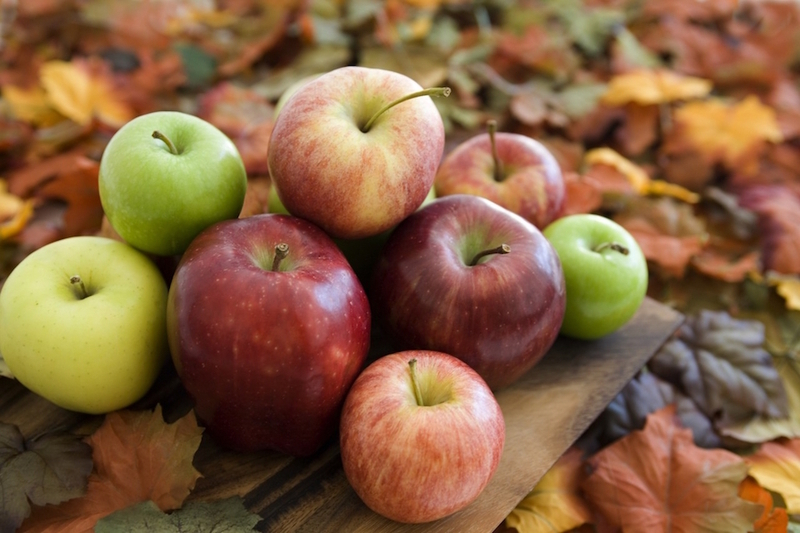 What’s your favorite way to use up Autumn’s bounty of apples? Share your recipes with us!